I love the self-satisfied physical weariness from bushwalking remote from the sights, sounds, smells and hard edges of civilisation. Because I’m too fond of my knees to jog, and dislike figure-hugging Lycra and controlled atmospheres too much to work out in a gym, it’s my near-perfect exercise, and a great partner to my other aerobic passion, dancing. As well as justifying high-calorie refuels, expending energy on a dance floor or mountain slope gives me a high that not only soothes sore feet and aching muscles; it also exhilarates me, empowering me to do it all again the following day. In contrast, however, the stress of two ongoing family health crises over recent weeks has left me bordering on punch-drunk, emotional exhaustion draining me of energy. A common experience, according to the internet! Several studies conclude that while physical activity has little or no impact on mental performance, and sometimes even a positive effect, mental stress can markedly affect us physically. At its worst it can impair judgement, reaction time, situational awareness, motivation, alertness and memory, leading to sub-optimal performance. So last week, when the depressing grey sky cleared – yes, I know we need the rain! – to a gorgeous sunny blue, I drew on my remaining judgement, reaction time, situational awareness, motivation and alertness and took myself off for a therapeutic stroll at a historic Goulburn Valley winery. Founded in 1860, Tahbilk has been owned and operated since the 1920s by five generations of the Purbrick family. It’s a charming place to visit, if only to wander around the heritage buildings – an episode of Phryne Fisher was filmed here. There are, of course, delicious wines, including the estate’s signature Marsanne and Shiraz from pre-phylloxera vines dating back to the mid 19th century; and a café which overlooks the extensive network of billabongs, backwaters and creeks. There are also walking tracks to tread between wine tasting and tucking into seasonal regional fare. Having registered at the café – management ask walkers to sign in, so they know where to start searching if you don’t return – and paid my gold-coin donation, I followed the well-formed track down to historic Long Bridge. Built from estate-hewn timber to replace a ford on the site, shortly after completion of Goulburn Weir in 1889, and extensively repaired after the destructive 1954 floods, the bridge was completely rebuilt in 1996, again with timber cut and milled on site. Across the bridge, I soaked up vitamin D as I strolled a 5.6km curlicue of flat compacted gravel track and boarding. Through floodplains thick with mixed wattles erupting in late winter yellows; past majestic river gums that have stood here for centuries; along waterways dotted with black swans, pelicans and moor hens and rows of grape vines reaching into the distance. I skirted massed fluffy reed and pools of rain and photographed bark, wattle blossoms, bird boxes and afternoon sun reflected off the water. I didn’t raise a sweat. Barely upped my resting heart rate. But boy did I feel better afterwards. And to increase the restorative effect of my day out, I bought some Tahbilk wine to take home. 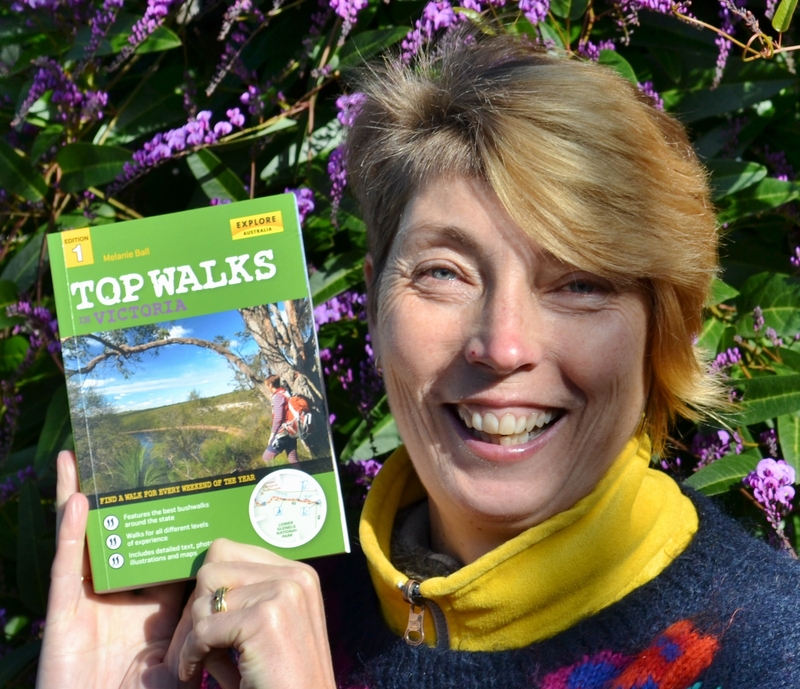 Tags: Australian history, bushwalking, escape, fresh air, getaway, hiking, history, leg stretch, natural therapy, on foot, out and about, outdoors, take a walk, the great outdoors, therapy, wine | Permalink.